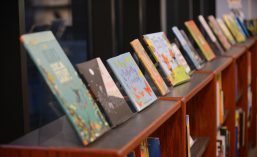 This rich collection of thirty-one Grimm’s tales combines familiar stories, such as “Hansel and Gretel,” “Rapunzel,” and “Rumpelstiltskin,” with lesser-known tales like the haunting “Fitcher’s Bird” and “King Throstlebeard.” While the anthology contains no formal introduction, internal notes or citations, there is a table of contents and a list of color illustrations in the front matter. Alderson also includes detailed “Afterward” and “Notes” sections in the back matter, in which he affirms his mission for the book. He states that many English translations of Grimm, though accurate, “miss the spirit of the tales” (188), and his objective for this collection is to translate the German tales “not from the scholar’s study but from a storyteller talking to his listeners” (188). He succeeds in this goal, as the translations are clear, concise, and readable—yet they still contain anecdotes of humor, gruesome description, and evocative imagery. Alderson notes that the Brothers Grimm stories “exist in a number of forms,” and his translation “is largely based on texts which had reached [the] final form, the ninth edition of the ‘Grosse Ausgabe’” (189). When he uses previous versions of the tales in his translations, he does not make a specific source note in the internal text, but he does mention it in the “Notes”, which are a thorough three pages long. 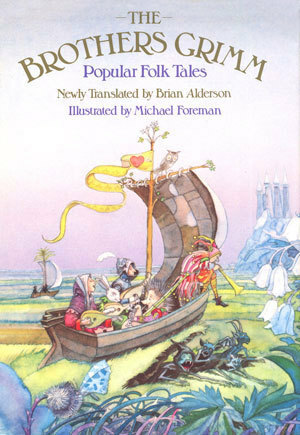 Alderson comments that himself, his illustrator, and his publisher chose the specific tales to be included, and notes that the order of arranging the tales is intentional. He states, “It was hoped that the sequence of stories would have a naturalness about it that would make it comfortable for readers to work through, if they wished, from one end to the other” (189). Michael Foreman’s dynamic illustrations enhance the collection, as each tale begins with a black-and-white thumbnail sketch and twenty-six full-color, vibrant, watercolor illustrations are scattered throughout the book. Foreman captures the tone of each tale, using muted and dark colors, shadow, and thin lines in the mysterious tales and luminous color, imaginative details, and softer lines in the lighter tales. The collection’s most remarkable feature is its potential diversity of audience. Because of the collection’s comprehensible translation, it is a great resource for the oral storyteller, but it is also a worthy selection for upper-elementary children, as the illustrations bring out the pathos of each story. Translated and illustrated by two qualified, experienced experts in children’s literature, this collection is a significant addition to the canon of folklore for children.